Concerto mask is from Gypsy Renaissance's Musical Masquerade collection. Concerto is a black velvet mask with black braiding, gold sequins, and black jewels. 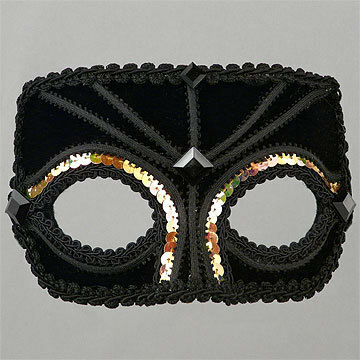 Concerto mask is covered with black velvet fabric and decorated with black braiding and black and gold or silver sequins. Mask is finished with black jet jewels.